Last month, “06880” reported that “Typewriter Eraser, Scale X” — Claes Oldenburg and Coosje Van Bruggen’s 19-foot, 10,300-pound sculpture of, yes, a typewriter eraser — was gone, after 20 years, from its Beachside Avenue lawn. 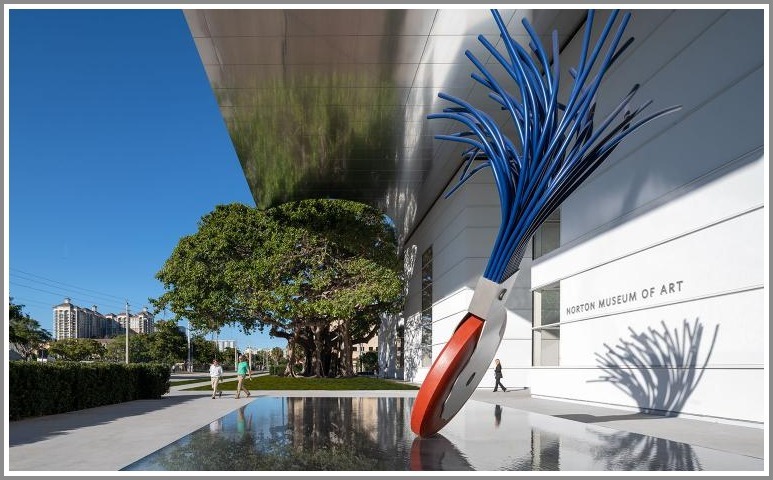 Its new home would be the Norton Museum of Art, in West Palm Beach, Florida. It’s now fully installed. If you’re in the area — and, given today’s weather, who wouldn’t want to be? — you can see it, tilting proudly on the front plaza. Sam and Ronnie Heyman — who commissioned the piece in the late 1990s — donated it to the Norton. The work welcomes visitors to a completely renovated museum. And the new Norton — sparkling in the sun — came about thanks in large part because of 2 Westporters. Ronnie Heyman is a Norton trustee. And Gil Maurer — who brought in architect Foster + Partners, and saw the renovation through from start to finish — has lived here since the 1950s. He and his wife Ann — equally passionate about the arts — own a winter home in Palm Beach. The new Norton is a game-changer for the arts scene in Florida. We should all visit it, and enjoy the Heymans’ and Maurers’ efforts. In fact, today would be a great day to go! This entry was posted in Arts, People and tagged Beachside Avenue, Foster + Partners, Gil Maurer, Norton Museum of Art, Ronnie Heyman, Sam Heyman. Bookmark the permalink. Kinda miss it during my bike rides along Beahside. Always a reminder of the arts influence here in Westport instead of “just” Gold Coast mansions. I was in Palm Beach two weekends ago…Was in the Uber going to the airport and what did I see…You guessed it, the Eraser caught my eye! For those who care, it was displayed very nicely and prominently in front of the art museum.